The Lakes at the Bluffs are popular entry level townhomes in the Bluffs community. The spacious floor plan affords you 2 bedrooms- 2 1/2 baths with an outside patio for grilling or for your pet. 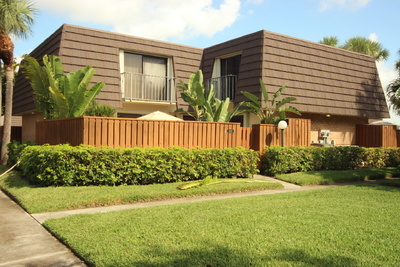 The community is a short walk or bike ride to Jupiter beach. With over 1200 ft.² of living space the townhomes make great full-time residences for those looking for a beach home.The community this meticulously maintained and features a community pool as well as racquetball courts and a car wash area. Pets under 25lbs. are allowed as well as pickup trucks without company logos. Browse listings for available Jupiter Lakes condos, or Read more about the Lakes at the Bluffs in Jupiter. The popularity of all the Bluffs communities has several reasons for the constant demand these properties. The location east of the intracoastal, close to the beaches of Jupiter and minutes to shopping and dining. The Divosta built community has always been known for their excellent construction qualities and well laid out floorplans. The Bluffs of Jupiter offer an array of different home options from intracoastal condos to oceanfront condos as well as single-family homes that are always in high demand. All the Bluffs communities are meticulously maintained and it shows as you drive through the communities. Many homebuyers never leave the Bluffs but may move from community to community. The Bluffs Ridge homes are always popular Jupiter beach homes. Not only are the Bluffs communities close to the beach but at the end of Marsinski Rd is the Jupiter dog beach which is always a great place to meet other dog lovers. Inside the Bluffs River community there is also a fenced dog park which is another great place to exercise your pet. If you decide to drive your vehicle to the beach there is public parking available for you. The County Park on Marsinski features sand volleyball courts and picnic tables which is a great place to have a party. The Juno beach pier is also very close and is a great stop for people watching, fishing or sightseeing. Shopping and restaurants are also quite close to the Bluffs communities. With all these factors you can understand why the Bluffs continue to be a popular place to call home. Call us today to show you all the homes in the Bluffs at Jupiter. Search for other real estate in neighboring communities such as Singer Island condos which are oceanfront condos or Hutchinson Island condos to our North for more affordable beachfront living. If a Lakes at the Bluffs listing has caught your eye or you want more information about Jupiter, FL real estate, please don't hesitate to call 1-561-744-7025, or email via our handy contact form with any questions or to arrange a showing.